This post is by sustainable community organizer Lookman Muhammed. You can read his first post here. My name is Lookman Muhammed. I work with A Just Harvest’s Genesis Project specifically the “Aquaponic Social Enterprise”. My first blog post explained a lot about my work here, what I do, and the purpose of my work with A Just Harvest and LETS GO Chicago. These two organizations have a common goal to fight hunger and poverty through urban agriculture. My responsibility is working to maintain and increase the effectiveness of our aquaponic system located in Gale Academy on Marshfield and Jonquil in the community of Rogers Park. The North of Howard area is where a great majority of the population we engage reside. Since my first post I’ve been doing much more work with North Side P.O.W.E.R., an organizing entity within A Just Harvest. North Side P.O.W.E.R. has been organizing around social justice issues, such as housing and public safety. The most recent work has been an action against Chase Bank for holding foreclosed mortgages that could be used for low income housing opportunities for families that are struggling with housing issues. Part of my responsibility with North Side P.O.W.E.R. has been helping research contact information on public officials about these issues and participating in protests, demonstrations. The individuals participating with North Side P.O.W.E.R. are among the few people I’ve met that actually care enough to address these problems through action. I find it exciting that people take time out of their busy schedules to organize and be actively involved in addressing these issues. On October 21, 2012 at the University of Illinois Chicago (UIC) I volunteered at a hunger walk to heighten awareness around issues of hunger. I was given the responsibility to distribute refreshments at a rest stop for the walk pass out information. I enjoyed being the person walkers approached to receive water, fruit, and jelly beans, and encouragement. The actions North Side P.O.W.E.R. takes in their community is greatly needed, because of the fact that not many people care enough to address and fight for the people who have no voice in this community. The reality is, all people have a voice, but many don’t use that voice, to help people in need. The hunger walk was a major success with eighteen volunteers and walkers from A Just Harvest and over 500 walkers in total. I was given the duty to put all of A Just Harvest’s community gardens to bed this past October. Unfortunately there was so much crop that could have been harvested and eaten by someone who needs it but instead some was placed in compost, and most went to waste, but just because the winter season approaches does not mean the growing will stop. The Genesis Project’s Greenhouse is still growing greens bountifully. I am currently planting seedlings in plant trays for almost 800 individual micro greens, lettuce, and herbs to be sent to the greenhouse for growing. An image of the rain garden that LETS GO Chicago built at the United Church of Rogers Park. In addition to my work with A Just Harvest, I am also staying involved as an active member of LETS GO Chicago, our local chapter of Summer of Solutions. I’ve continued to do work installing rain gardens in the community and helping out wherever I can. 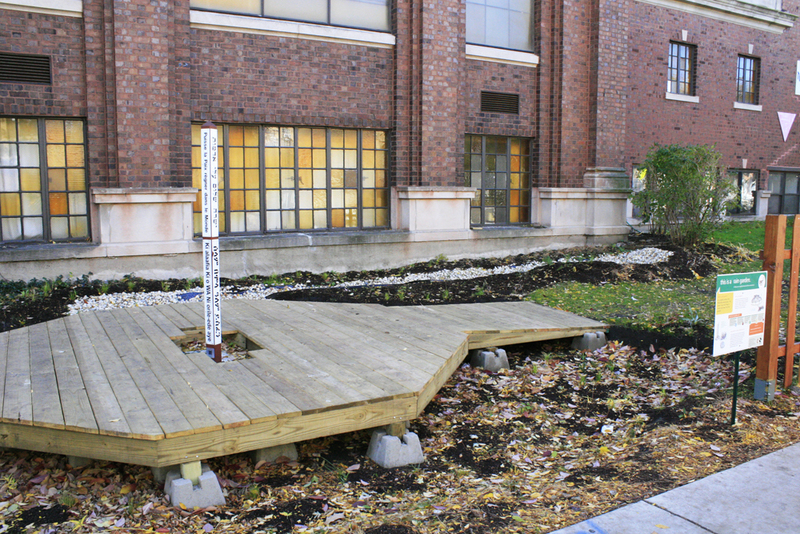 At the beginning of the fall, we built a 200 square foot rain garden with a deck feature at the United Church of Rogers Park that will capture roughly 30,000 gallons of stormwater annually. 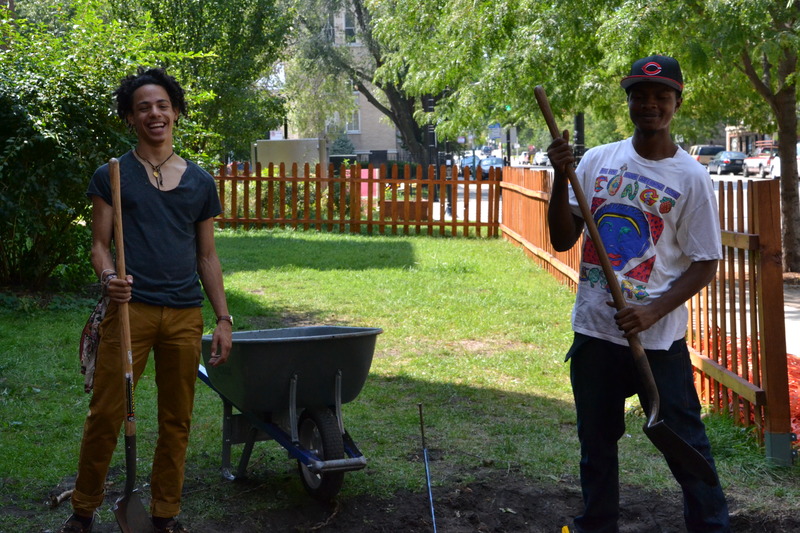 We also made slight changes to a rain garden our team installed last summer in Rogers Park. Recently, we have been at work putting gardens of our yard sharing network to bed for the winter. I’ve come to learn that a long summer of hard work brings many things to be taken care of during the fall. I’ve also applied to be a program leader for Summer of Solutions 2013 in Chicago and I’m excited for the new skills I will learn and to be able to utilize them next year.